Suppose we are in a territory rich with buried treasures. We may map the territory, but we will be enriched only when we mine it. Scripture is a territory rich with the treasure of spiritual wisdom. When studying a scripture such as Bhagavad-gita, we may need or want to map it. To that end, we may analyze how one verse leads to the next, how one theme segues into another and how one chapter links with its adjacent chapters. Simultaneously however, the essential treasure of scripture is found not through mapping but through mining. Mining scripture means going deep into scriptural verses for assimilating and applying them. Only through such internalization of the scriptural message will our consciousness expand, enabling us to relish spiritual reality, including the ultimate spiritual reality, the all-attractive supreme, Krishna. 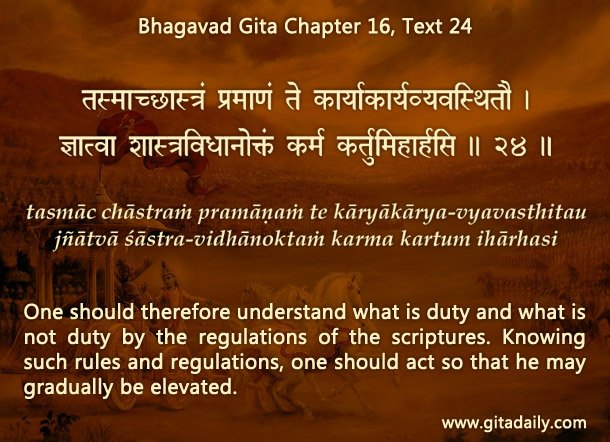 The Gita itself stresses that scripture is meant to be mined, that is, used as a guidebook for action (16.24). Moreover, its conclusion demonstrates how mining it is sublimely enriching. Sanjaya applies the Gita’s core message – to focus the mind on Krishna – and relishes constant joy as he recollects Krishna’s words (18.76) and form (18.77). While studying the Gita, we can map it as much as possible. Mapping the Gita is valuable to the extent it helps us in mining it systematically. But mapping shouldn’t become an end in itself – nor should it consume us so much that we forget to mine what we read. To be more concerned with linking verses than applying them is counter-productive. We need to focus primarily on contemplating what the verse means to us and how we can internalize it. If we develop this mood of mining the Gita, especially by associating with those Gita savants who are expert miners, even one Gita verse can provide us endless enrichment. What is meant by mapping and mining of scripture? How can mapping scripture help or hinder mining scripture? Which Gita verses would you like to mine? How can you mine them?